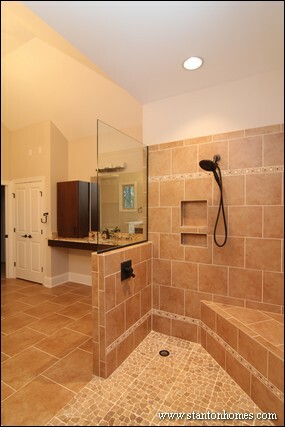 Shower benches are a popular request for NC new custom homes with tile showers. Whether you want a simple perch or a massive seat, you'll get ideas from these 12 Stanton Home tile showers. 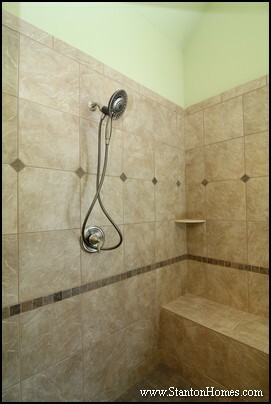 The shape and size of your bench will depend on the footprint of your shower. 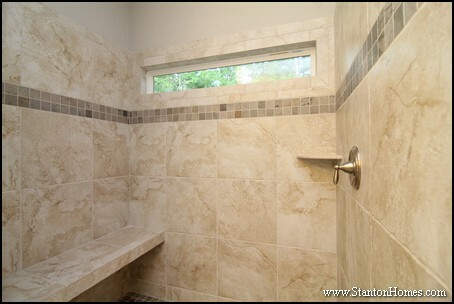 This shower is extra wide, with plenty of space for an angled bench tucked into one corner. 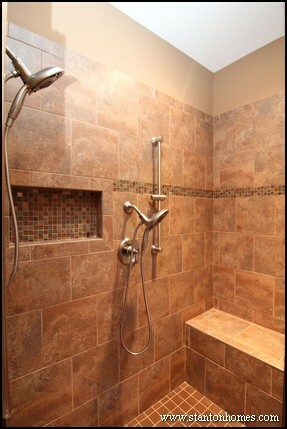 A his and her shower head is located at each end of the shower. 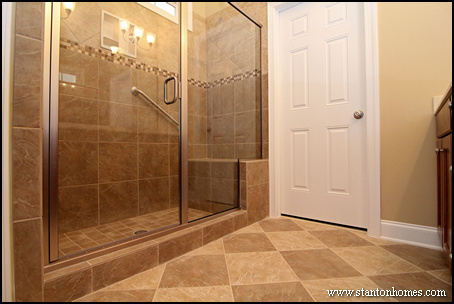 If the tub and shower sit side-by-side, consider extending the tub deck into the shower. 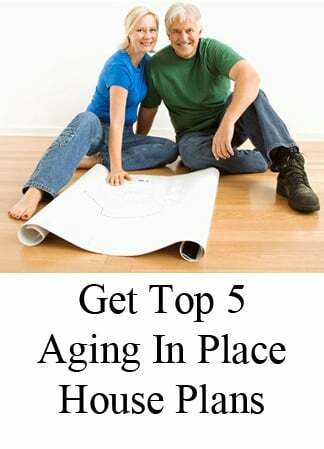 This will create a shampoo shelf and offer a space to integrate a small tile seat. 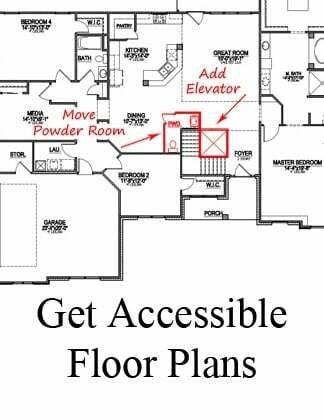 This configuration works well in smaller showers. 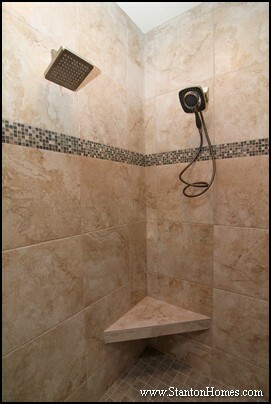 In this dual shower head design, the angled seat sits low on the wall, perfect as a leg shaving ledge. 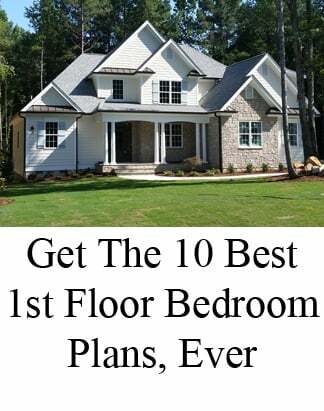 It also leaves more leg room in the shower. 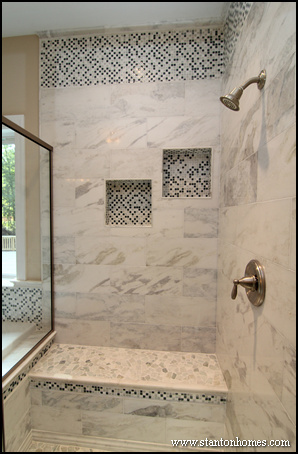 This shower features four types of tile - from mini mosaic to pebble - creating a spa retreat feel with whites, greys, and blues. With two built-in storage niches, this shower seat is reserved for sitting! 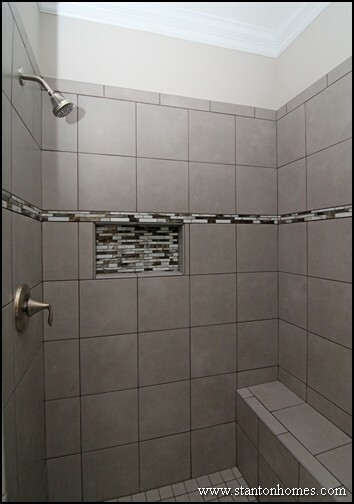 This shower bench extends the full length of the shower, leaving no gap between the tile wall and glass enclosure. 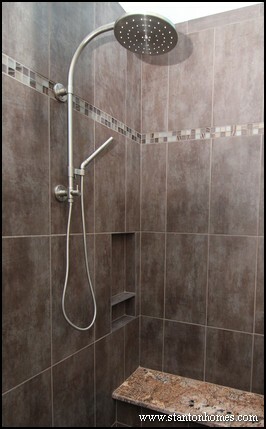 Grab bars - an aging in place and ADA design feature - make the use of this shower bench safer. 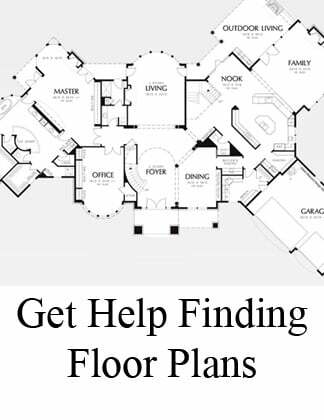 Whether or not you're planning ahead, grab bars can be a smart addition to any large shower. 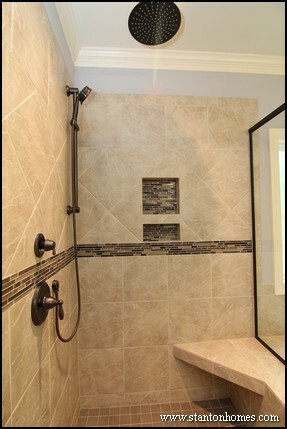 In this two shower head design, one adjustable height shower head was placed beside the bench - making rinsing off and shaving easier. You can tuck away large toiletries, below this free standing shower seat. 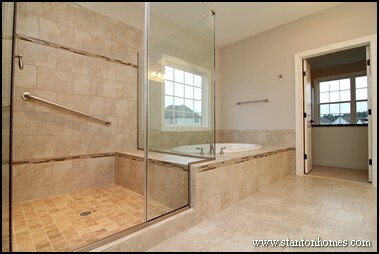 A long window adds natural light to this shower, another aging in place recommendation. A thin shower bench leaves more open space in this small shower design. Thin benches are best used as a balance point, rather than a seating area. This solid seat top requires even less cleaning - with no grout lines. 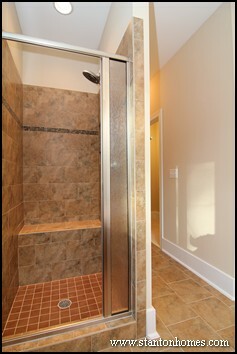 Even a small alcove shower can become more functional with a built in bench. Benches are a practical addition to showers that are much longer than they are wide - with plenty of space at the opposite end of the shower head.